The welfare state in postwar Western Europe has been extended and intensified in a spectacular manner. Today, "welfare" represents a complex mix of services covering health, education, welfare, the arts, leisure, and social security. Anton C. Zijderveld is of the opinion that Europe's vast, comprehensive welfare state is becoming leaner and meaner, heading down a more sober path toward decentralization and deregulation, which only, but not merely, secures order for its citizens and shields society's vulnerable. As the millennium approaches, Zijderveld believes Europe is experiencing a cultural renaissance and a socioeconomic and political reformation in which the market will flourish and civil society will prosper. 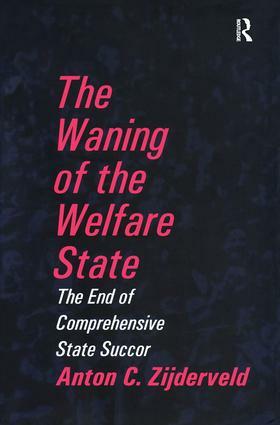 The Waning of the Welfare State focuses on the transformation of the welfare state in Europe over a four-decade period. Zijderveld employs the democratic triangle theoretical model, in which democracy is viewed as a system in which state, market, and civil society are held in precious balance. If one component supersedes the other two, democracy is endangered. In its 1960s and 1970s heyday, the state took center stage at the expense of the market and civil society; social democracy was the prevailing ideology. In the 1980s the market triumphed, often at the expense of both the state and civil society; this was the decade of liberalism. Today, civil society prevails, albeit at risk of being injurious to state and market. Ideologically, this is the decade of conservatism. Zijderveld sees a future "Americanization" of European social policy producing a fortuitously balanced coalition of social democracy, liberalism, and conservatism; a place where safety and order, prosperity and economic participation, and social participation and meaningful interactions flourish equally. This transformation carries many risks. But it will, in the end, strengthen Europe's political, economic, and sociocultural stamina. If it also draws the Atlantic partners closer together, as Zijderveld believes it does, the chances of another European communist, libertarian, or fascist Gtterdommerung will remain remote. Zijderveld presents useful concepts in a highly organized fashion. He has produced a very important book for American readers who will, hopefully, discover, beyond the often vast differences, some basic similarities of structures and developments within the European welfare state.